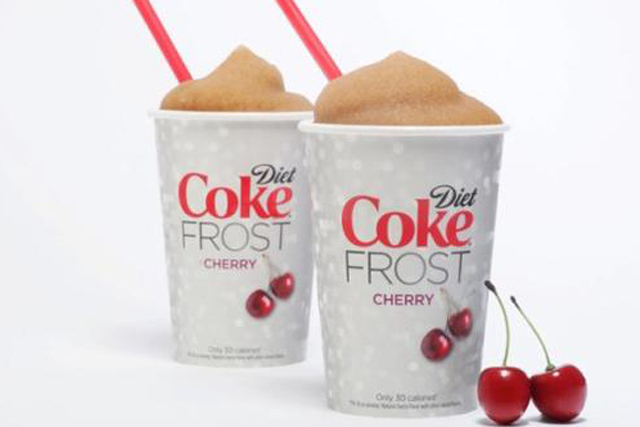 Coca-Cola is launching a Slush Puppie-style semi-frozen drink called Diet Coke Frost Cherry, which goes on sale this week in the US. The drink became available yesterday as a Slurpee exclusively at 7-Eleven stores across the US, with the product rolling out in other retailers' "frozen drinks" machines at the end of May. Slurpees are sold by 7-Eleven under licence from The Icee Company, which also owns Slush Puppie, the brand better known to UK consumers. A 20-ounce serving of Diet Coke Frost Cherry includes natural cherry flavour and contains 30 calories and 12g of carbohydrates. Stuart Kronauge, Coca-Cola North America’s general manager for sparkling beverages, said: "Diet Coke Frost is a great-tasting, refreshing uplift for any time of day. Providing fans with yet another way to enjoy their favourite beverage demonstrates why Diet Coke continues to be the number-two beverage in the US. "Exclusively partnering with 7-Eleven for the debut of Diet Coke Frost brings this innovation to people nationwide, in a setting famous for delivering frozen perfection." Consumers who download 7-Eleven’s free mobile app to their iPhone or Android phone can claim a coupon for a free Diet Coke Frost Cherry. Earlier this month, Coca-Cola revealed it was making a $1.25bn (£767m) investment in Green Mountain Coffee Roasters (GMCR), a company that is developing its own home-based fizzy drinks system.